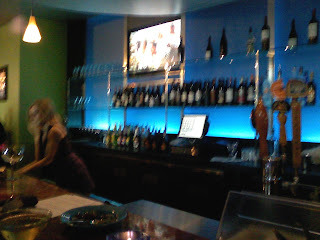 I attended a private grand reopening party at Therapy Cafe last evening. I was looking forward to seeing how the place would look after closing in February to undergo massive renovations. And it is indeed a massive change. The new Therapy looks nothing like the old Therapy. The owners bought the space next door formerly occupied by Lola's and expanded to be what seems like about four times the size of what it used to be. If you ever visited Therapy in the past then you'll recall that it was a small, intimate place that felt more like a lounge than a cafe. Now it's a restaurant and bar. If you walk into the main entrance from Tryon Street, you're facing the large bar, which is pretty much in the center of the long, narrow room. The space is very colorful, filled with neon blues and greens, has plenty of windows, and has a very modern feel. There are numerous tables and booths so you won't have as hard of a time getting a seat like you once did here. Please excuse the quality of my camera phone pics. Therapy now has a full, open kitchen facing one of the small dining areas, giving it sort of a to-go order feel. This is in the right corner of the room. The entire place actually feels like three places in one. If you really liked the old Therapy, you probably won't be as big of a fan of the redesign. It's lost its intimate, lounge feel. But you'll be happy to know it has retained what most made it popular in the first place: the great double-martini menu. And they'll continue to offer Martini Madness on Wednesdays, during which all martinis are half price (who can pass up getting a $12 martini for six bucks?). Plus, because it is now a full-service restaurant, you have a much larger food menu to choose from. I think overall you'll enjoy it here, but you'll just have to expect something different--different from what Therapy used to be, but similar to restaurant/bar concepts that have opened in Charlotte. As for what I ordered there, I had one of the Starters: the Mama’s Meatballs, which is Italian-style meatballs served with Parmesan cheese and garlic toast. It was very tasty. And I washed it down with two martinis: the Mother's Milk (I now see a theme to my order), which has vodka and Bailey's in it, and I had another martini (I forgot the name of it) that contained a double shot of Red Bull. 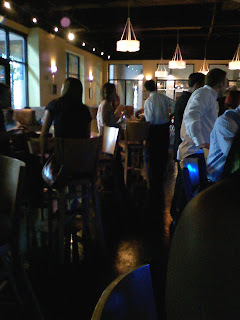 The wait staff was friendly (and equally attractive) and the bartenders were very knowledgeable of the drink menu. Therapy is planning a public grand reopening party for Thursday. Visit www.therapycafe.net for more details.